When Sharon Jones sang at the New Orleans Jazz & Heritage Festival in April, the blue-and-white fringe on her sequined dress never stopped swaying. The short, stocky woman kept her hips and shoulders in constant motion as she belted out one old-school soul number after another over the horn-fueled momentum of her backing band, the Dap-Kings. The fringe functioned as a visual reinforcement of the strong rhythmic pulse that shuddered up through her throat and outward throughout her body. The fringe stopped swaying last Friday when Jones finally succumbed to the pancreatic cancer she had been battling since the first diagnosis in 2013. She was 60, but her career had been all too brief. After decades of wedding bands, back-up singing and day jobs, she didn’t release an album under her own name till 2001 at age 45. Now she is gone. 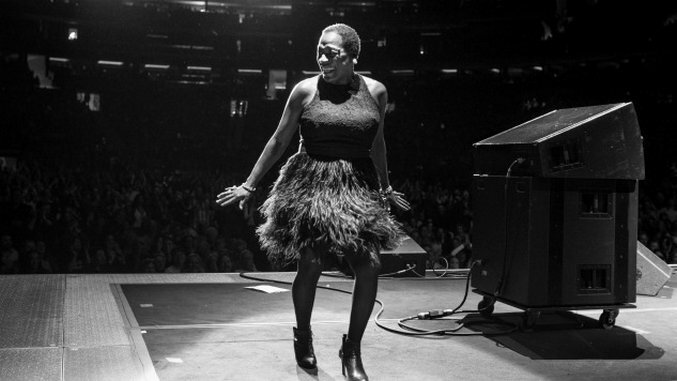 The fringe on her dress has a starring role in the documentary movie Miss Sharon Jones. A scene of that dress in onstage action measures Jones’s journey by offering a sharp contrast to the dark-blue uniform of a Rikers Island prison guard, her most notorious day job. Soon there’s another contrast as Jones sits in a beauty salon chair and quietly sobs as her Afro is cut off in preparation for her chemotherapy. She holds a coil of hair in her fingers and ponders its message. Those three images stake out the lows and highs of Jones’ life, and Oscar-winning director Barbara Kopple (Harlan County USA), fills in the gaps with a surprisingly candid look at an artist on the ropes. This is not a Hallmark Channel story of dying woman who bears her burden with saintly smiles; this is the tale of a prickly woman who gets angry at the multiplying cells within her and at the well-meaning people around her. But she ultimately channels that feistiness into a determination to get back into the studio and back on the stage. The climactic scene finally arrives when she takes the stage at the Beacon Theater in New York, bald and barefoot in a tight, shiny silver dress, giving the crowd a foot-stomping, elbow-flying demonstration of the R&B dances of her youth. But when she tried to repeat the moment during a concert to celebrate the film’s premiere at the 2015 Toronto Film Festival, the audience gasped when she announced that her cancer had returned. The disclosure was an emblematic Jones gesture: She never held anything back. Jones was born in James Brown’s hometown of Augusta, Georgia. Though her family moved to Brooklyn when she was three to escape an abusive father, she returned to the South most summers. There, she absorbed the fundamentals—both sonic and visual—of classic soul music. After years of dead-end singing jobs, Jones got a break in 1996 when she was hired to sing back-up on a single by Lee Fields, the funk singer unknown to most but a legend to fanatical record collectors. One of those collectors, Gabriel Roth (aka Bosco Mann), was running the session for his fledgling label Desco Records. When that label folded, he started a new one, Daptone Records, and he picked Jones as one of his first artists. In the movie, Jones claims that all the big record companies had told her she was “too short, too fat, too black and too old” to make it. So she made common cause with Roth and his band of young R&B renegades, the Dap-Kings. The recordings they made were respectable but not spectacular, more like the B-sides of classic soul singles than the A-sides. It was easier to admire the singing, playing and writing than it was to remember specific tunes. It was only when you saw Sharon Jones & the Dap-Kings live on stage that you understood their immense appeal. Like her role model Brown, she created a performance that linked the sound of her voice to the movement of her body to the mood of the moment. That created an experience that could only be approximated by recordings or even by videos. The sheer physicality of being in the same space with her was transformative. In this, she was the mirror image of Amy Winehouse, another retro-soul singer who used the Dap-Kings as a backing band in the studio and on the road. Winehouse could be spectacular in the studio, but she often wilted in front of an audience. Jones was the opposite; she seemed to fully blossom only in front of a live crowd. I’m not the only skeptic who was converted by a first encounter with Jones’ live show. My conversion came at South by Southwest in 2010 when she gave the New Orleans spiritual “When the Saints Go Marching In” and the Woody Guthrie anthem “This Land Is Your Land” the same hard-funk treatment that she gave to her own tunes like “Give It Back” and “Nobody’s Baby.” Most impressive was the way she hit the stage with encore-level energy and never let up until she walked off again. I caught up with her post-chemo 2014 tour in Austria at the Vienna State Opera House. Jazz Fest Wien had devoted a full evening in the ornate venue—the private boxes stacked like layers on a wedding cake—to the Daptone Super Soul Revue featuring not only Jones and the Dap-Kings, but also Charles Bradley, Antibalas, the Sugarman 3 and Saun & Starr. There was enough talent on hand—especially in the person of Bradley, a force of nature—to ensure that Daptone will survive the deaths of Jones and Winehouse. But Jones deserved her headlining slot. Only a bit of her hair had grown back, but her huge gold-hoop earrings responded to every dance move as did her tight silver-and-blue dress. The highlight was “Get Up and Get Out” from the Give the People What They Want album that she finished before the first cancer scare and released after her apparent recovery. In the middle of the song, though, she stopped for a long rap about her cancer. When she returned to the song, she was no longer singing to a man; she was singing to a disease that was threatening everything she had struggled to achieve. “Get up and get out,” she wailed on the frenzied coda. The cancer got up, but it didn’t get out.